I have finished making Santa Stockings for a customer. Plus, I made a stocking for myself. Really, it's so I can write a pattern for it. I think it's the cutest...don't you? 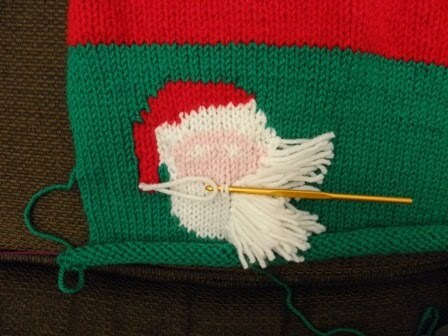 The stocking is basically a big ol' sock with an intarsia Santa face knit into it. There is Santa without his jolly face. To make the beard you need to make fringe. I did it by cutting a 4" strip along the long side of a page of card stock. 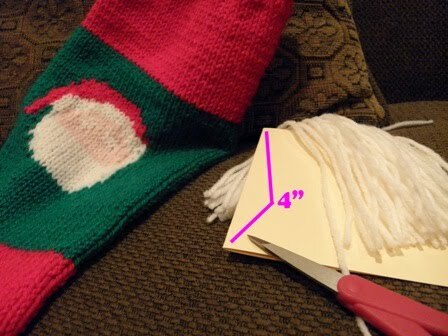 Then, folded the paper in half and gently wrapped the yarn around it a whole bunch of times. I slipped my sharp Fiscars in between the folded paper and cut the along the two edges to make a boat load of fringe. Making fringe takes me back to my childhood. I've been doing it since I was...maybe...8. Here's how I apply the fringe. 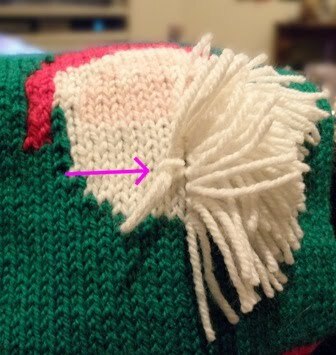 So simple, just use a crochet hook to pull a 4" piece if yarn (folded in half) under a stitch and thread the cut end through the loop. On to writing the pattern! I've been wondering for a while if I'd be able to find a pattern for this anywhere! My grandmother made me and all of my cousins one of these when we were born (as a first Christmas present) and I'd love to know how to make them for new members of the family since she passed away a few years ago. A bit of googling brought me here, I don't really knit so this would be very new to me, but I was wondering if you'd be able to give any advice? 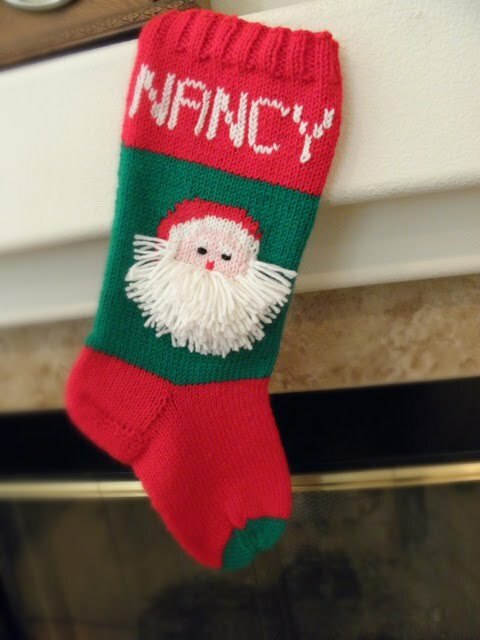 I am also looking to replace the stocking my grandmom made for me. Is the pattern finished? Is it possible to find it posted? Remember what Mother says; If you don't have anything nice to say, don't say anything at all! I'm Peggy Hagberg. Owner of Knit-University. I teach knitting and coordinate retreats. Take a class at Hobby Lobby in Temecula, CA. Contents of this blog are protected by copyright. Don't steal my stuff!. Simple theme. Powered by Blogger.